The Bosch system on the Felt monitors the riders torque, cadence and speed 1000 times a second and calculates the power output to smoothly match the riders input. It makes you feel like you have the legs of a pro rider. And it has shift detection that senses when you shift. The Brose motor on the Specialized reads only the riders torque and speed, and is not as smooth or natural feeling as the Bosch. But the Brose has more power and torque and feels much stronger. Without shift detection the shifting is often loud and clunky. The Lebowske motor is fairly quiet, it’s not as loud as some high end hubs. But the Levo is almost silent by comparison. It does remind you to shift by emitting a higher pitched when in a low gear and high cadence and a low pitched audible hum when climbing in too high a gear. The gearing on the Lebowske is not suited for mountain biking. The 18 tooth front chain ring is actually the equivalent of a 44 tooth gear because of the internal motor gearing. Even with the 10-42 rear cassette it’s geared too high for mountain biking and I’m often forced to bump up the power for some climbs. I usually only use the 3 largest cogs on the rear cassette when mountain biking or snow riding. The gearing on the Levo is ideal for mountain biking. I generally used all of the gears while mountain biking. The Levo has plenty of ground clearance and a skid plate to protect the motor and shorter crank arms resulting in fewer ground strikes. The Lebowske has no skid plate to protect the motor and the plastic engine case could easily be damaged with even a minor impact. It also has 175mm crank arms that easily and often touch the ground if you aren’t careful. The Lebowske is a blast to ride in the snow. The battery life does not seem to be affected by the cold, and I’ve ridden it as low as -10°F. I only rode the Levo once in the snow and only in temperatures as low as 32°F, so I don’t have enough data to comment on the cold weather battery performance. It was crazy fun in 4 inches of new wet snow! The Lebowske medium frame is listed as an 18.5 inch, and the geometry is fairly neutral. Not too upright and not too racy feeling. The Levo medium frame is listed as a 17 inch and the geometry is more like a race bike. Since I bought my Lebowske, the price has come down $2300. 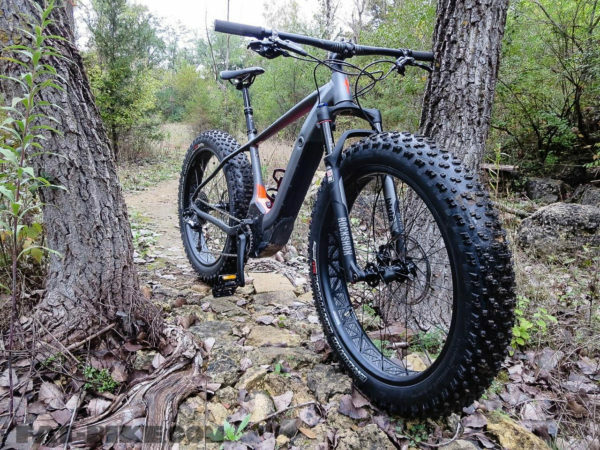 Right now both the Lebowske 20 and the Turbo Levo HT Comp (both are Bluto equipped) are $4999. About me… Mountain biker since 1990. Trail builder and trail advocate since 2003 after attending my first (of many) IMBA Trail Building Schools. I’ve helped build some of the best trail in Wisconsin, including trail in the Chequamegon Area Mountain Biking Association system, the John Muir and Emma Carlin trails in the Southern Kettle Moraine State Forest and Rock Cut State Park in Illinois. And about a mile of singletrack in my back yard. I discovered I had an incurable rare degenerative muscle disease, which has been slowly shutting down my voluntary muscles in 2011, a month after getting my first fat bike, a 2010 Salsa Mukluk. By 2014 I was about to quit mountain biking because I did not have the strength or muscle endurance to enjoy climbing hills the way I use to, and staying with my friends was no longer possible. Then I heard of a new technology that could help supply the watts that my legs could no longer generate. This disease was cheating me out of the thing I love the most, so I got a Felt Lebowske eFat Bike in December of 2014 to even the playing field. Great Article and comparison. You bring up details many of us simple riders would not think to ask about. Very useful Craig! Great article Craig! Thank you for sharing your personal challenges and perspective. I think that if more people in the cycling community were aware of stories like yours there would be less hubbub regarding E-bikes. Thank you Sir. Craig, glad to hear the findings of your opportunity to test and compare two e-bikes. Kinda interesting how they can differ so greatly.